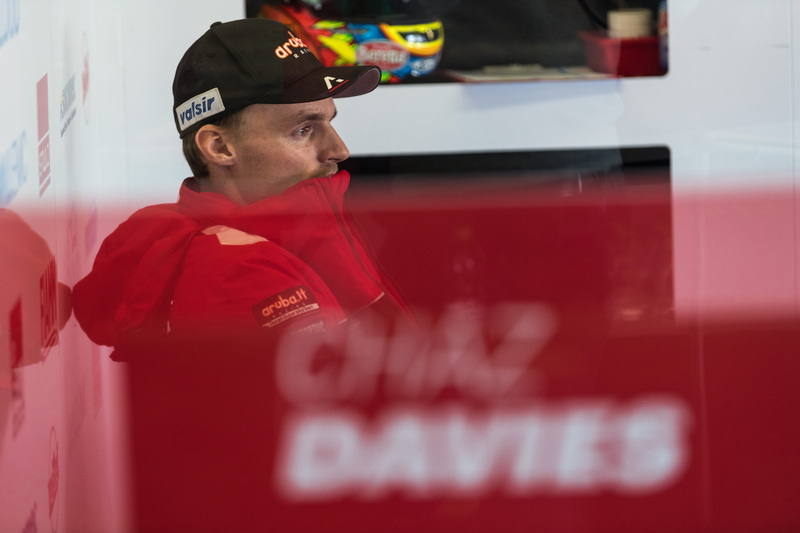 Davies in reflective mood during testing. Chaz Davies admits he is still getting used to his new weapon which he hopes will power him to World Superbikes glory next season. The Powys-born rider will complete the final day of testing in 2018 at Aragon on the new Ducati Panigale V4 R bike he will debut in Australia when the new campaign gets underway. Having again finished runner-up to Jonathan Rea last season, Davies will be looking to his new seat to finally end the Ulsterman’s four-year title winning streak. Davies tests his new Ducati in Spain. Davies has now had three days of testing with the V4 R completing 49 laps yesterday ay the Spanish track to finish with the third fastest time. The Aruba.it Racing – Ducati rider clocked a best time of one minute 40.202 seconds to finish just behind new team-mate Alvaro Bautista. “We’re figuring out the new bike step by step and, while it’s still early, the start has been positive,” said Davies ahead of Tuesday’s final day of testing before the winter break. “The package definitely has great potential. I’m very confident we have a better weapon to fight with. That said, we just need time. “We’re trying to walk before we can run, because there is a lot to learn about the V4 R and it’s easy to get carried away. So, I’ve been cautious, trying only a few changes. Davies in discussion with one of his engineers.